THE year 2018 is one 24-year-old Zimbabwe racing sensation Axcil Jefferies describes as bitter-sweet. Bitter, because Lady Luck seemed to desert him in crucial events and sweet in that he competed well in almost all races and actually won the Lamborghini Super Trofeo Middle East Champions for the second time in a row. It was also a season in which he had a lifetime opportunity to work with childhood hero and Hollywood superstar Will Smith, who was working on a reality series to be released in January next year. 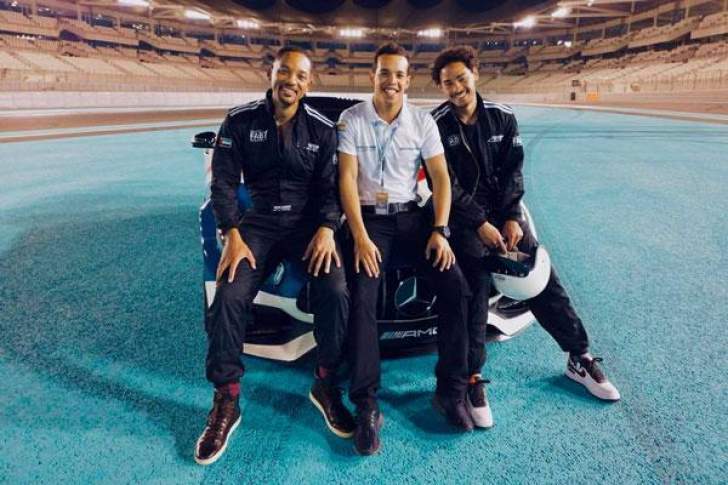 Smith and his boys Trey and Jaden were part of the festivities at the Formula 1 season-ending event - the Abu Dhabi Grand Prix last November, where they were also shooting a reality series at the Yas Marina Circuit. As fate would have it, Jefferies is the senior race instructor at Yas Marina and it was inevitable for the Smiths to interact with him and he will feature in the reality show alongside five-time Formula 1 world champion Lewis Hamilton. "Well, the experience was pretty cool to be honest. It was actually one of the highlights for me this year, meeting my childhood hero Will Smith and working with him along with his boys," Jefferies told The Sports Hub. "Will was so humble and genuine in my interaction with him, just exactly how you would imagine him to be. We were shooting for a reality series that he is starring in. It will be released in January 2019," Jefferies added. Jefferies would, however, not give more information on the reality series that the Fresh Prince of Bel-Air star was working on. Smith was in Hamilton's tow for the drivers' parade ahead of the Abu Dhabi Grand Prix and even shot a hilarious skit that went viral on social in which he kidnaps the reigning F1 champion. The opportunity to interact with the famous American actor was a fitting finish to what has been a roller-coaster racing season for Jefferies. "To be honest, 2018 was a bittersweet year. On the one hand, we were competitive at every event this year, but, on the other hand, we did not seem to have luck on our side. Nevertheless, it was still a promising year, as we won the Middle East Championship and had a couple of podiums in Europe," he said. "Winning the Middle East Championship was probably the best highlight of the year. On the other hand, I would say Misano in Italy was probably our worst event all year. We had a tyre issue in qualifying which compromised our whole weekend," Jefferies added. Jefferies and his German partner Fabian Vettel, younger brother of four-time F1 champion Sebastian, finished a commendable 10th place at the World Finals despite encountering serious car problems. The Konrad Motorsport driver spoke on his experience partnering Fabian this year. "To be honest, the approach with working with Fabian was no different to working with any other team mate. Of course, it's pretty cool that his brother is a four-time Formula 1 champion, but for us at the track, it was business as usual," he said. As always, the year ended on a high note for Jefferies as he got the chance to interact with F1 superstars at his home track, the Yas Marina Circuit in Abu Dhabi. Amid the pomp and fanfare, he met his mentor F1 driver Polish veteran Robert Kubica. Kubica will also be making a return to F1 next season and will line up for Williams at the season opener in Australia next March. "I am really happy to see Robert (Kubica) back in Formula 1. When I used to be part of the BMW Junior Programme a decade ago, Robert was my mentor and it's always nice to meet him," he said. Jefferies, whose dream is to become the first African driver to make it onto the Formula 1 Circuit, competed in Formula BMW, Formula Two Championship, Indy Lights and the GP2 Series before entering the prominent Lamborghini Super Trofeo Championship last year. He hopes to make another step up next year. "For 2019, the goal is clear. I would like to make the step up to GT3 and continue to make a name for myself in the GT world of motorsport," he said.